Until today, I had no idea that the inside of a persimmon seed could tell us what kind of winter we are going to have. Knowing it now, I am on a quest to find some locally grown persimmons so I can see inside and provide my own prognostication about the winter. How does the persimmon predict the winter? It all has to do with spoons, forks and knives. If you see a spoon shape inside the persimmon seed, it means lots of wet, heavy snow. If you see a fork shape, it means light, powdery snow. If you see a knife shape, it means cold, cutting winds. You can read more about how it works on the The Old Farmer's Almanac website. I suppose if you cut open several persimmons, you might find some of all the cutlery. In that case I assume you determine an average number of knives, forks and spoons and use that to prognosticate a cold, snow-of-some-sort kind of winter. I also assume that to predict your own weather, you need to find persimmons that were locally grown. The persimmons pictured above are from the garden of Robin of Bumblebee Blog. She was kind enough to respond to my shout out for persimmons and sent me a picture of one of hers. I think that is a spoon shape, which means she should expect wet, heavy snow this winter. Or maybe that is a fat knife and she will experience a cold winter? As for me, I don't know what my winter will be like, yet, as I haven't found any locally grown persimmons to check. I did hear that someone in the next county to the southeast saw so many knives and forks in her persimmons this past week that it reminded her of the winter of 1978, which we all remember for the last major blizzard we had around here. Most of us who lived through it just call it The Blizzard or the Blizzard of '78. It was in January, which means that next January will be the 35th anniversary of this storm. I would guess that after 35 years, we are due for a some kind of winter. I'm just not sure what kind of winter. I won't rest now until I find some locally grown persimmons so I can figure it out. Yes, indeed, I'm on the prowl for persimmons so I can prognosticate and predict. This sounds like witchcraft:) I love it.....and I love eating the fruit as well:) I have no fruits on my tree this year but I'm hoping next year. Oh Gosh! I hope we don't have another 1978 winter! No persimmons here but the geese have been heading south for a while and the hummingbirds left early. The squirrels and chipmunks are very busy as well. In March, I will make my winter prediction. Ha! I'm praying the prediction for another winter like '78 is totally wrong--I won't forget that year! I have 2 friends with persimmon trees, but we live too many counties south of you for it to be helpful with your Indy prediction. sorry! We have persimmon trees all over the neighborhood...I shall bring a few home to check them out! I hope you're wrong about the snow here, Carol. It makes life very difficult for the humans and the chickens. The little dogs love the snow though. Nevertheless, I will always make sure to have plenty of birdseed on-hand. 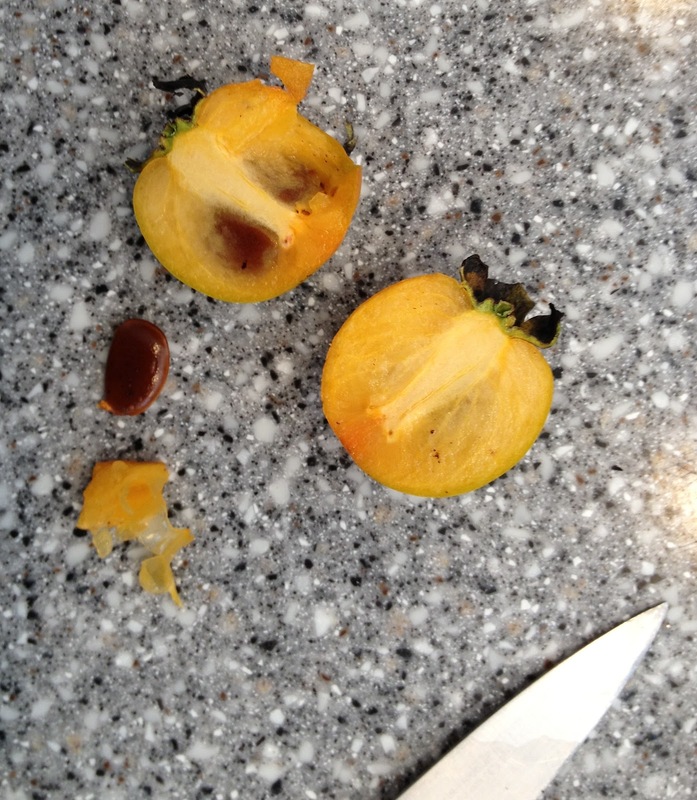 The Farmers Almanac link said to cut open the seed, not just the persimmon. It looks like the persimmon seed in the picture has not been cut. I'm not sure you're doing it right. No persimmons here. Not even any wooly bear caterpillars. Just damp gray skies and they tell us nothing. Geez, I remember the winter of '78...lived in Northwestern Ohio at the time and was twice marooned in the snow with my practice truck. I see Robin is in Zone 7, so lets hope she doesn't get lots of snow....I suppose the coast is different from the southern plains, though. I am certain that there will be winter this year and that the weather will be colder than it was in the summer. There will be precipitation of one form or another. Winds will blow clouds in and out so there will be some sunny days, too. Mark my words, I'm always right about this sort of thing. My long-term forecast: Spring will follow!